Jeremy Irons at the 2018 BAM gala, Ozymandias in Doomsday Clock #1. 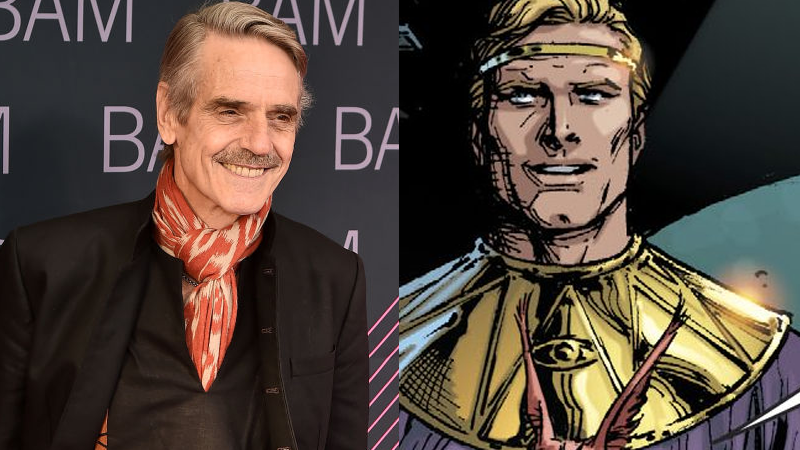 We’ve known for some time now that Jeremy Irons had joined the cast of HBO’s upcoming, live-action Watchmen series from Damon Lindelof, but it remained a mystery who the actor was set to play...until now. SlashFilm is reporting that Irons will portray an older, though nonetheless still nefarious version of Adrian Veidt, the brilliant megalomanic known as Ozymandias who, in the comics, orchestrates a plan that kills thousands of people in an attempt to avoid an oncoming nuclear war. Because HBO’s Watchmen is set 10 years in the future from any previous continuities we’ve seen in the past, it makes sense that this version of the character is somewhat older, and his inclusion in the show’s cast suggests that, mature or not, Ozymandias is still at least partially getting himself involved in global, vigilante-related affairs. SlashFilm also reports that Legion’s Jean Smart has been confirmed to play a new character called Agent Blake who specializes in hunting vigilantes—which may or may not be a reference to the Comedian, whose civilian name was Edward Blake. It’s a strange new world that HBO appears to be cooking up for Watchmen--so you gotta ask yourself, are you ready and willing to watch it? Will You Watch the Watchmen?